Summer is just getting into full swing, and in Texas that means food. We know how much you love your summer cookouts, because we love them, too. We can’t think of anything that tops an evening spent around a table with good food and friends to share it with, especially if that food is comprised of the delicious assortment of lobster rolls, fried clams, or speciality deli sandwiches catered by Maine-ly Sandwiches. While we know that summer gatherings are incomplete without buttery, creamy lobster rolls, there are still detractors out there hanging on to the myth that hot dogs are the better choice. Don’t let those naysayers fool you. And when those little birds start chirpin’ in your ear, you can quiet them with these tested facts about why lobster rolls will always trump those worn-out hot dogs. 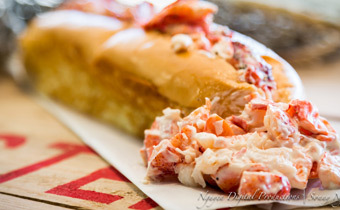 With a lobster roll from Maine-ly Sandwiches, you know exactly what kind of meat you are getting: Lobster. Hot dogs tend to be a mish-mash of leftover chicken parts and added fillers. True Maine lobster rolls should contain lobster meat that has carefully been diced into delectable, plump chunks. Hot dogs can’t say the same as the aforementioned poultry trimmings are ground up and mixed with other things until they are reduced to a goopy puree. Packed with protein and heart-healthy omega-3 fatty acids, as well as vitamins and minerals, lobster can be a healthy addition to your diet. Hot dogs, on the other hand, are full of nitrates and other preservatives that have been linked to cancer in some studies. These are just a handful of reasons why lobster rolls are better than hot dogs, but we can’t wrap up this article without mentioning the most important one: Lobster rolls taste better! So when you are hankering for a summertime treat or are planning to have an evening get together, make the right choice. Visit Maine-ly Sandwiches at our two Houston locations, or call to learn more about our catering services. Don’t wait, contact us today!